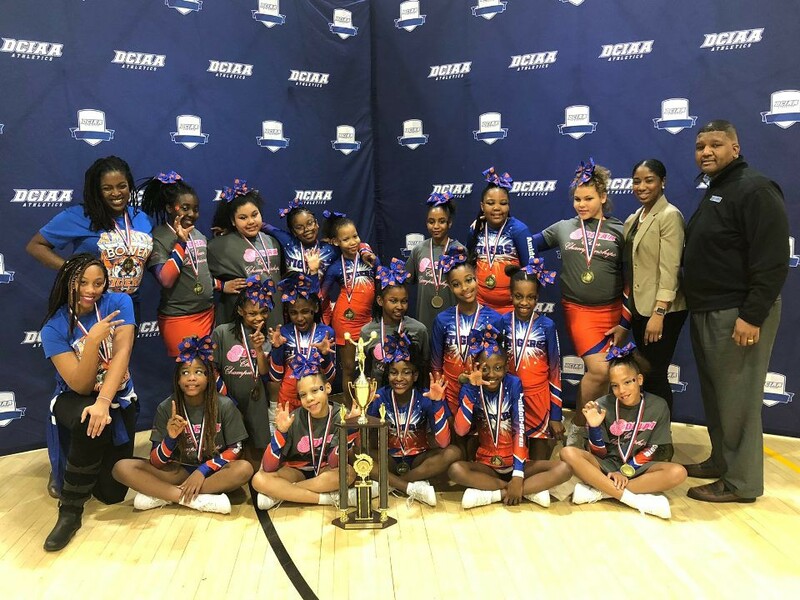 On March 9, the Amidon-Bowen Elementary School cheerleaders solidified their place in history by winning the Elementary School DC Interscholastic Athletic Association (DCIAA) Cheerleading Championship for the third year in a row. They also won the DCIAA Cheerleading Grand Championship award for the second year in a row. The Grand Championship award is for having the highest score across all levels. Amidon-Bowen Elementary School Cheerleaders’ overall score was higher than their middle school and high school counterparts. Head coach Ms. Christina Shelton (no relation to Author) and assistant coach, Ms. Asia Goode, who are also teachers at Amidon-Bowen Elementary School, believe they are not just cheer coaches, but life coaches. They make it a point to impress upon their cheerleaders that hard work, belief in self and the belief in one’s cohorts is a worthwhile effort. The coaches use their opportunity, working with the cheerleaders, to build coping skills, strengthen life skills and build community on the team. These skills are nurtured in training and they are meant to be carried out in performances, in the classroom, on the playground and in life. The effects of this cultivation have established a cohesiveness of the team that manifests in a strength and closeness among the girls that shines bright in their performances. Their bond allows them to move in time with a sense of oneness. Their focus and diligence are ever present in every step, flip and hoist. Amidon-Bowen Elementary School’s Cheerleaders proved that winning comes from a place of love, dedication and connection to the sport, the team and to self. There are many things to love about the Amidon-Bowen Elementary School students. Two of those things are their winning spirit and dedicated hearts in all that they do. In school, children should be given a place to grow, learn about themselves, and touch the energy of success. Through the dedication and pushing of strong leaders like the Amidon-Bowen cheerleading coaches, our children have once again succeeded in winning and rising amongst the stars. The Amidon-Bowen community appreciates the hard work of all of the girls and coaches. Their work and challenges have been documented by Amidon-Bowen parent Willem Dicke. The documentary of the Amidon-Bowen Elementary School Champions can be viewed in the lobby of Amidon-Bowen Elementary School.